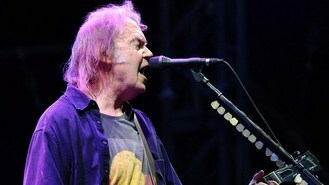 Neil Young And Crazy Horse have confirmed they will tour UK arenas next summer. The Canadian rocker will play his first concert with his band in the UK for 12 years in June 2013. The Heart Of Gold singer and the band have announced they will perform in Newcastle on June 10, before appearing in Birmingham, Glasgow and finishing at London's O2 Arena on June 17. Neil, Frank 'Poncho' Sampedro, Billy Talbot and Ralph Molina will perform tracks from their critically acclaimed double-album Psychedelic Pill. Neil Young And Crazy Horse recently completed a North American tour and are scheduled to tour Australia and New Zealand next March. Neil last appeared in the UK in 2009 when he played a series of triumphant sets at Glastonbury, the Isle of Wight festival and Hard Rock Calling in London's Hyde Park, where he was joined on stage by Sir Paul McCartney. He last appeared with Crazy Horse in Britain in 2001. War Child, the charity, will be receiving a Special Recognition Award at next year's Brits. The Rolling Stones have hinted that Lady Gaga might be toning down her performance when she appears with them on stage. George Harrison's leather jacket has sold for more than £110,000 in an auction of Beatles memorabilia. X Factor star James Arthur is set to top the singles chart this weekend after shifting more than 255,000 copies of Impossible. Love letters written by Mick Jagger to a 1960s muse have sold at auction for £187,250. Harry Styles and Taylor Swift wowed friends at a party by performing the iconic lift from Dirty Dancing. Victoria Beckham was apparently on a high after the premiere of Spice Girls musical Viva Forever, singing and dancing at the after party. Pink has revealed that she still feels like she has to prove herself. The long-awaited Spice Girls musical failed to go down well with the critics following its premiere last night.